Sixty years ago, one of the most auspicious events in the religious history of Marmora took place. On Sept 1st 1874, on land situate in a commanding position in this beautiful Ontario village, honored brethren of the Order of Freemasons added another to that Craft's long distinguished record of ceremonies, in connection with the erection of ecclesiastical edifices. The corner stone of the first and only Anglican church to grace the village and to be later dedicated to St. Paul, was well and truly laid by Right Wor. Bro, S. S. Lazier, of Belleville, D.D.G.M. in that year of the Prince Edward District. One of the two lots, which were to constitute the property of St. Paul's, was donated by the. Cobourg , Peterborough and Marmora Railway and Mining Company. The other lot was purchased from that Company for the sum of fifty dollars. On April 11th 1874 the money was furnished for the deeds. W. ·P. Chambles was the managing Director of the Company and David Bentley was their Marmora agent. Towards the purchase of the second lot the following men subscribed ten dollars each -Solomn Johns, William Leon. and, David Fitchett, David Bentley and A. W. Carscallen. All these entered into rest practically with the passing of the last century. On Monday night the village was roused by a fire alarm, and it was found that the Anglican church shed was in flames. Just how the fire started will probably remain a mystery, but it is just possible that it was caused by a spark which smouldered in a pile of ashes in the west end of the building, and was flamed by the high wind. The flames spread very rapidly and by the time a crowd had gathered the whole shed was in flames. A line of hose was stretched from the hydrant on Matthew street, but it was found that, that one was frozen up, and had to be changed to the hydrant on the corner of Forsythe and Madoc streets. This took considerable time, and before the water was turned on the fire, the building was completely destroyed. During the later part of the winter the chemical engines had been empty, owing to the cost of heating the hall and the danger of their freezing up and being seriously damaged. The shed contained a number of tables, benches etc. belonging to the church, and a considerable supply of wood for next season's use. At the present price of lumber the loss of the building is a heavy one, but the loss of the material stored in the shed makes it more serious for the members of St. Paul's. Note- since writing the above we have been informed that no ashes had been emptied in the shed for over a week previous to the fire, so that the fire could not have started from the pile of ashes. The cause remains a mystery. The stone for the erection of the church was quarried on the west side of Crowe River 'slightly' south of the bridge, whose western end adjoined the property of Marmora's first- sacred edifice, the old Roman Catholic church. (This reference is to St. Matilda's and the original bridge just north thereof) As funds were low, the completion' of the tower of St. Paul's was deferred untilabout ten years later, when a young English born mason was employed to quarry.and dress the stone. The bell was provided through a subscription taken up by Mr. Charles Bleecker and extended to its desired length through a canvass made by the late Miss Frances S. Jones, who was sister of Dr. H.M. Jones, who ran the drugstore. In course of time other church furnishings were added. The lectern was donated by Charles Vizzard, who was storekeeper ,for a while at Deloro, and the altar was beautified with panel work executed by James McClusky. . The present pulpit replaced the original one as the result of a subscription raised by the late Miss Jones. A new clergy stall in memory of the late Mr. Thomas Campion was placed In the chancel. It's inscription reads, "To the Glory of God and in loving memory of Thomas Campion, who entered into rest Jan. 29th 1908, aged 78 years. The memory of the just is blessed." In the north side of the church a memorial window was placed with the following inscription, "There remaineth therefore a rest to the people of God. To the Glory of God and in loving memory of Ezekiel D Boyd 1829·- 1903, Mary his wife 1833 -1898, Alexander, their son 1805-1896." The window depicts Christ holding the cup of blessing. The Campion and Boyd families were among the most regular attendants at St. Paul's . In 1910 the church was beautifully carpeted through the munificense of Mrs. Grace Deacon. Eleven years later Mrs .. J. Douglas Wells, of Montreal, cousin of the late Canon Harris, donated the cross which adorns the altar. Its inscription runs "To' the glory of God and in loving memory of Mary H. :Harris 1907, and J. Douglas Wells 1920." Prior to the erection of St. Paul's, services of Anglican and Methodist ritual were alternately held in the old Town Hall. Much history of that period has been lost because there was no weekly paper at that time and practically speaking, no one kept a diary. Each of the religious denominations represented in the village population was blessed with members who revealed a sturdy type of Christianity and they had a friendliness which one writer draws attention to, which passed with them. Among the ardent workers for the Anglican cause was the late Miss A. H. Bentley, who established the first Sunday School in the village about eighty years ago. The earliest Anglican services that could be recalled by old worshipers in recent years were those conducted somewhat irregularly by a clergyman named Groves. The advent of the Rev. James Preston to the parish of Stirling resulted in Anglicans of Marmora having a monthly service which was maintained successively by the Rev. Henry Edward Massey Baker and the Rev. George Grout. Stories great and inspiring of those early church activities have been passed down to posterity to inspire the ardent of today in their labours. Shortly after the completion of the church, when the Rev. J.Godden of Stirling was in charge of the services, Rev. J. E. Halliwell was instrumental in the appointment of the Rev. CharlesMountain Harris as Marmora's first resident rector. No one saw with this appointment the long record of Christian devotion and service that was to ensue. After forty-four years of diligent labour in this corner of the Master's vineyard, the life of saintly mould entered the far serener clime. It was not, however, before he had seen two daughter churches, St. Mark's. Rawdon and Holy Trinity North Marmora erected in his original parish. He. aIso saw, St. Paul's Ladies' Guild organized to become a real asset to the church. A few months passed and there came to the mourning parish the announcement that Bishop Bidwell's choice of a successor had fallen upon the Rev. Philip Craiger-Watson, then stationed in North Dakota. At the same time, a stone fence was built to enclose the church and rectory, and provides an attractive setting to present day.Throughout his rectorship, the activities of the parish were well sustained and augmented to include a branch of the A.Y.P.A. "The parish also became self supporting and the rectory was built. In November 1926, Rev. P Craiger-Watson accepted the invitation to become rector of Galetta in the diocese of Ottawa. "The lot is fallen unto me in a fair ground; yea, I have a goodly heritage" , Psalm 16:Y (Prayer Book version). And with the recalling to memory of the many dutiful souls who now rest from their labours undertaken for St. Paul's, comes also the remembrance of the hymn verse recited by the then rector of Picton, as he urged comprehensiveness in the conception of the church. "One family we dwell in Him. One church above beneath, Though now divided by the stream. The narrow stream of death." In St. Paul's church register of Baptisms whose entries go back to Jan. 20, 1873, when Rev. John Halliwell recorded the baptism of WilIiam Charles Holland, son of William and Sarah Holland, the number of baptisms up to, Sept 24th, 1934 number 1246. 'The .number of weddings total 290 and commencing with the burial of David B. Johns ,on May 22nd 1876, the number of burials to date is 555. 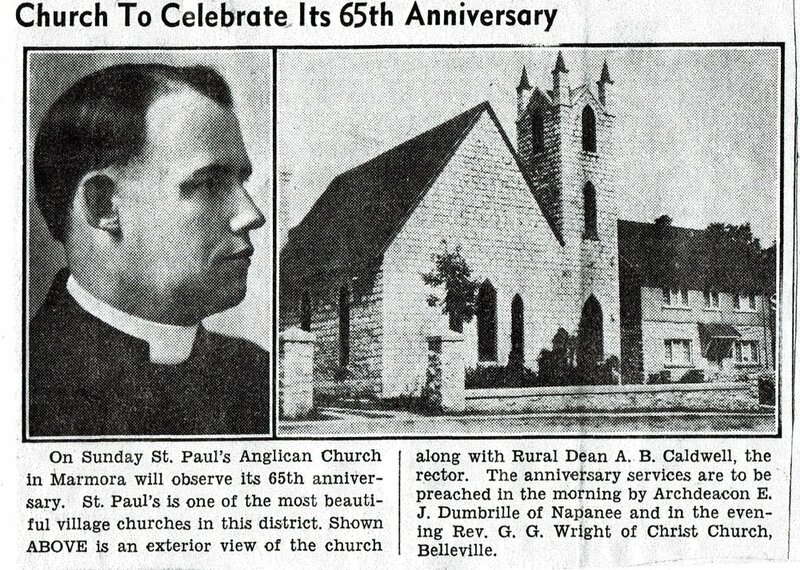 To read the full Anglican Church 75th Anniversary Historical booklet, click here. Bishop Lyons appointed Rev. J. M. Brownlie, L.T.H. S.T.H., a graduate of Trinity College, Toronto, in 1944. Rev. Brownlie felt the need for a robed choir and altar boys. Ivan Lavender, Jim Hickey and John Brownlie were trained; Ivan Lavender was the first local boy to assist as altar boy. The interior of the Church was decorated, new lighting installed; Rev. Brownlie served the Parish from 1944 to 1956, when Rev. Fleming took over. During his appointment the outside of the parish hall was stuccoed. In the fall of 1962, Rev. Robert Stewart came to us from the Diocese of New Westminster, B.C. He was appointed Rural Dean of Hastings in October 1964. Under his leadership, a beautiful planter was built and shrubs added on the west side of the church. A Memorial Book was started. Rev. Stewart resigned to accept the Parish of St. Mary Magdalene at Picton on Sept. 1, 1967. Also In 1974, the interior of the church was completely redecorated by a local artist, Luigi Rossi. In 1993, prior to the arrival of Rector Rev. Gordon Walls, the rectory was completely renovated with new kitchen cupboards, kitchen floor, wall-to-wall carpeting in upstairs and stairway. winterizing of back entrance, including new door and steps. All renovations were done by volunteers John Solmes , William Mumby, Jack Smith and Clifford Partridge. To read about the 1974 fire in the Manse, click here. In 1997, John Hewitt, a contractor, replaced the sidewalks into the church and hall and front door of the rectory. Also that year, the stained glass window in the main entrance was replaced. by Jim Kerr and Christine Sager in memory of their parents and grandparents, Sarah and George Kerr, Stanley and Joan Kerr. In 1998 restoration was made to a stained glass window situated in the center of the north hall of the church. Mae Simmons and family made this possible through a donation made in memory. of William (Bill) Simmons. Mae Simmons at the Bicentennial tea - 1985 hosted by St. Paul's Anglican Church. Bill Simmons was the treasurer & bell ringer for many years. Received from Dan Delong: - St Paul's Anglican Church in Marmora - drawing on a Christmas card from Minister Jack Howard, who had earlier ministered at St George's Anglican in Hastings.